Philip Gore-Randall joined FRA in 2017 as its first Non-Executive Chairman. He has extensive experience at a senior level in large private and publicly-held international organizations. Philip has a portfolio of non-executive roles, which currently include Chairman of three international private equity backed businesses.. He is also on the Board of an international alternative investments (principally private equity) group and adviser to several major businesses in the UAE. His previous non-executive roles include Chairman of ERM, one of the world’s leading international environmental consulting firms (private equity backed); Director of Esure and an independent member of the International Executive Committee of Lovells (now Hogan Lovells) the international law firm. He has also been a member of the Advisory Council of The Prince’s Trust and a Council member of the Confederation of British Industry. 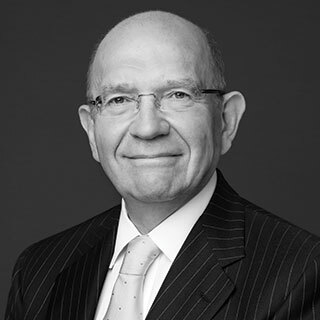 Philip spent the first 25 years of his career at Andersen where he was elected UK Managing Partner in 1997, having previously run the UK and European Assurance and Advisory practices. In 2001, he became Managing Partner and Chief Operating Officer of Andersen’s global practice. The following year he co-led the worldwide dissolution of Andersen and then became Chief Operating Officer of Aon UK, following two years as CEO of its Risk Services division. In 2007, Philip joined the Board of HBOS plc as Chief Operating Officer and served in that role until it was acquired by Lloyds Banking Group in 2009. Philip has an MA in geography from University College, Oxford and is a Chartered Accountant.